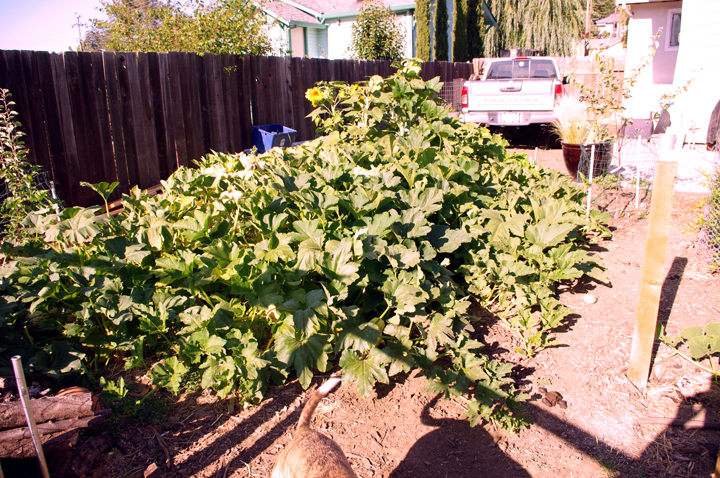 Our yard had been completely overrun by squash for pretty much the entire season. We could barely get to one of our herb beds and reaching the second herb bed was completely out of the question. For those that aren’t familiar with squash vines, they have lots of little spines all over them, and while they won’t draw blood, I have had the misfortune of getting invisible splinters from them. Actually, come to think of it, I have had blood drawn from scraping against them too quickly – but more in a road rash kind of way. Little did we know, however, that Squeek was immune to the spines and had been getting in there on a regular basis to do her business. As the vines began to die back we decided it was time to pull up all the squash so we could begin the process of curing it. Curing is simply allowing the skins to harden so the squash keeps for as long as possible. Of course it also sounds more difficult than it is. All you really have to do is store it in a well ventilated, warm area out of the sun for a couple of weeks. As we pulled out the vines we became acutely aware of the smell that our darling dog had left amongst the spiny vines. The horror that awaited us under the dying vines was getting uncovered. Somehow these vines were shielding the smell. Wow! It hit us like a truck. Fortunately the smell dissipated quickly and once it was all cleaned up, everything was back to normal. Clare, I wish we could train ours to just stay on a specific surface. Granted the squash she was using was in "their space" as it was a volunteer.